Rules or no rules, his kids are a half-mile down the trail by now and all the neighbors/family he’s invited along on this outing — upwards of 20, near as I can tell — are deeply confused: they’re reading “no bikes” signs but their Outing Leader insists otherwise. He saw it on the Internet, it must be true, right? I had 9.5 miles under my feet and my brain was a little muddy when I passed Outing Leader Guy. 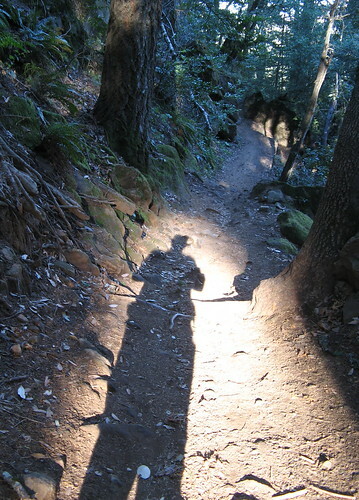 Didn’t occur to me till I got back to the car that he was looking at the wrong section of the Saratoga Gap Trail. I’m grateful: For once somebody besides me is going the wrong way. 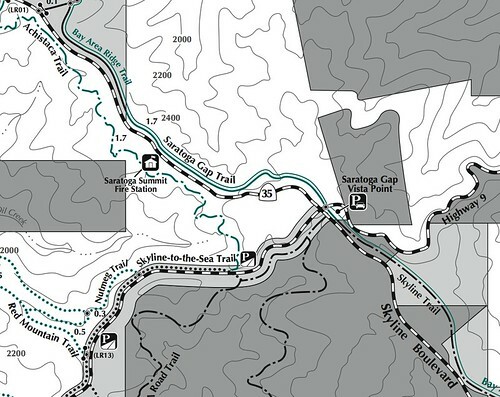 It’s a common launch point for overnighters into Big Basin State Park along the Skyline to the Sea Trail or Castle Rock State Park via the Saratoga Gap Trail (it’s the spur heading due south just south of the Gap in the map above). And the Skyline Trail goes to Sanborn-Skyline County Park, which has some excellent bouldering opportunities. 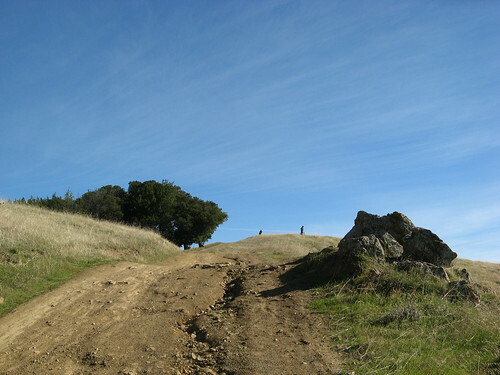 Few hikers venture into the stretch of the Saratoga Gap Trail north of Highway 9 — the biking-approved section of the trail passing through Saratoga Gap Open Space Preserve, in green above. In keeping with my tradition of taking seventeen paragraphs to get to the point: I decided to exploit the free parking at the Gap and head north into Saratoga Gap Open Space Preserve, then head over to Long Ridge Open Space Preserve to Peters Creek Trail and return via the Achistaca Trail, crossing Highway 9 and making the last leg along the Saratoga Toll Road Trail, which is where the tykes on bikes showed up. 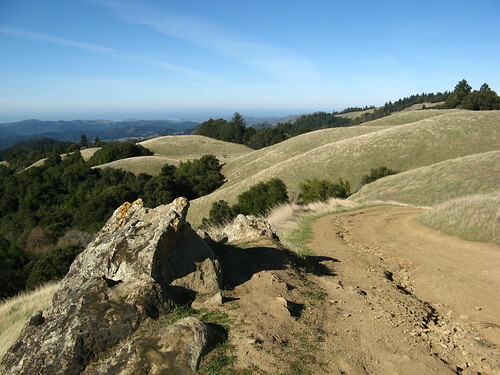 It’s a nice loop of just under 10 miles — noisy from the highway in places and mountain biker-rich in others … not everybody’s cup o’ java, I suppose, but I had perfect weather, no mud, spectacular vistas at Long Ridge. All in all, a fine hike. 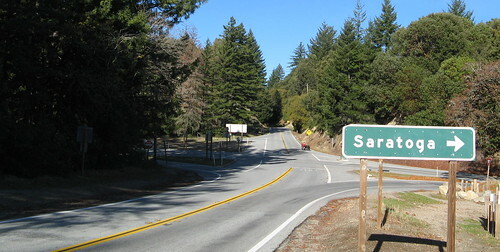 Highway 35 looking north at Saratoga Gap. Highway 9 heads westward towards Big Basin Redwoods State Park. Saratoga Gap Open Space Preserve is over to the right, north of Highway 9. 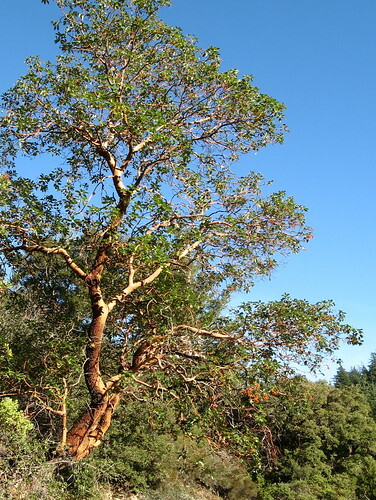 Gorgeous blue skies along the Saratoga Gap Trail. This is the biking-legal section Outing Leader Guy was looking for. 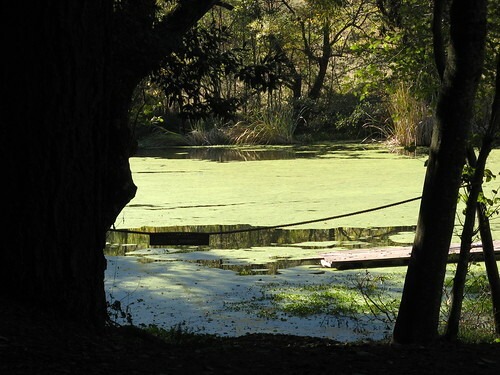 You’d definitely teach your kids some bike-survival skills taking ’em riding with the grownups along these trails. Just don’t let Mom find out. The trail dives into the woods soon enough. It’s mostly shaded after the open section at the beginning. Highway sounds are pervasive the whole way, which tends to annoy veteran hikers but might actually be reassuring to rookies (you’re never truly lost if you can hear the highway). Crossing Highway 35 into Long Ridge Open Space Preserve. 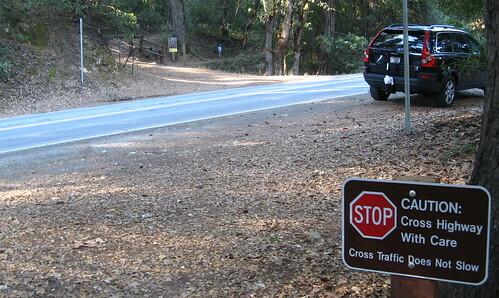 The sign does not exaggerate the extent of drivers’ indifference to crossing hikers. 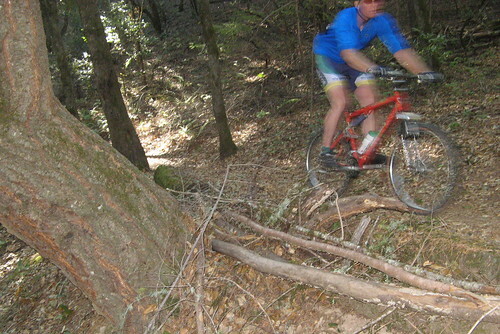 There’s a little stretch of the Long Ridge Trail that could fairly be described as Mountain Biker Nirvana. It’s three-quarters of a mile, mildly downhill so little leaning on the brakes is required, all single track under tree cover with a few hairpin turns thrown in to make it interesting. Nice hiking, too, if you enjoy the challenge of staying out of the bikers’ way (best to go up so you can see ’em coming). 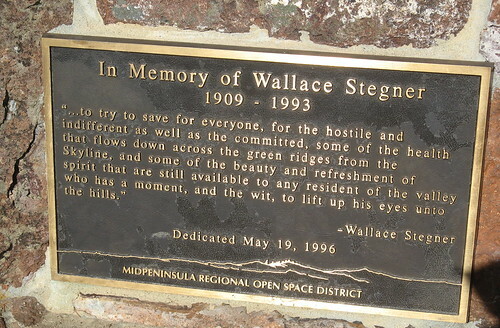 The famous Wallace Stegner stone bench is near the turnoff to the aforementioned link in the Long Ridge Trail. I added a little under a mile by taking a long, shady downhill along Ward Road, which required a steep, sunny slog along the Hickory Oaks Trail to get back to the main trail. The rest of the hike took me along the hikers-only Achistaca Trail to Highway 9, where you cross the road and turn left to head back toward Saratoga Gap. I like the way the afternoon sun hit this tree. Something to keep in mind if you go ridge hiking up this way: it’s all and down; there’s no single big peak to climb, but a whole lot of little ones. The climbs add up after a few hours. My previous Long Ridge hikes. 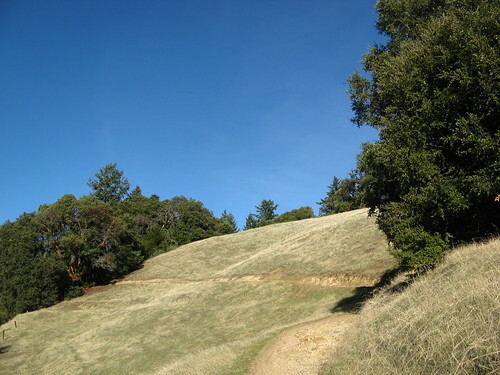 Long Ridge Park Profile, written for the Mercury News. While returning via the Achistaca segment a couple weeks ago (a Saturday), I was appreciating its no-bikes ambiance (hey, enjoy what there is to enjoy) only to encounter – first by sound – a rather funky motorbike, driven slowly by what looked like an Imperial Storm Trooper. I wagged my head, the bike approached, stopped, and the rider raised his helmet. He dutifully accepted my apologies and appreciation for his official patrol duties keeping other wheels off that trail. He relished his ticketing tally. I don’t recall which official agency he was with, though.